Anyone who has ever lost hours playing a brick-sized black and white Game Boy will recognize the retro action that is 1-bit Ninja, but this isn’t just a nostalgic blast from the past. With this app developer kode80 has achieved a fine balance between old and new. On first impression, 1-bit Ninja looks a little like a Mario Brother’s knockoff, but the second you swipe the top of the screen you see a seemingly two dimensional word gain a perfect sense of three dimensional depth. The object of the whole game is to get to the end of every level as quickly as possible while jumping on top of scooting enemies and collecting coins and bonuses, but 1-bit’s biggest surprise is the fact that your one pixel ninja only moves forward toward his goal. In other words, there’s no going back on 1-bit Ninja, which creates a sometimes frustrating, but admittedly new twist to the indie throwback title. The traditional direction pad is replaced with a sectional touch control interface. Tap the bottom left of the iPhone screen and you’ll send 1-bit Ninja scurrying forward. Tap the right of the screen and he catches air with jumps, but if you ever need a new perspective on the course you can swipe the top section of the screen. This offers an usual (but almost artistic) three dimensional view on this virtual world. This top-of-the-screen swipe reveal of a new dimension is in and of itself enough to turn 1-bit into a truly innovative title, but as it stands the emergence of a new dimension is only temporarily functional on 3G devices. 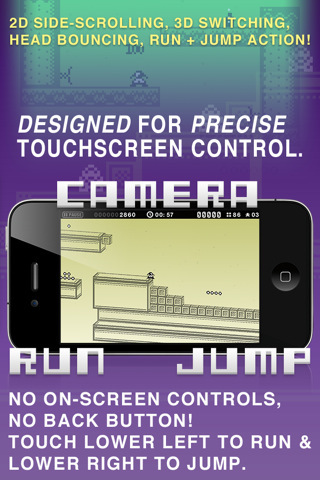 Release your finger from that top part of the screen to run or jump and the new perspective (and your view of secret paths that reveal themselves in 3D mode) is entirely gone. Players on newer devices though, have the pleasure of unlocking other fluid multidimensional camera modes. 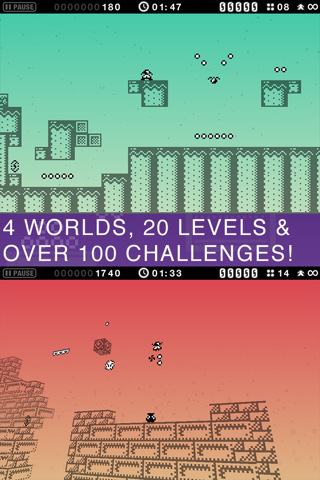 Other than the hard to reach unlocking of four worlds, 1-bit Ninja shies away from social achievements. Game Center competitions and all those connectivity extras are nonexistent here, but for some purists this isn’t a bad thing. Unlike most games in the app store, 1-bit has some art to it and playing seems to emphasize experience and process more than anything else. Those immersed in 1-bit’s appeal will get lost in trading off between racing through the game’s 100 levels and collecting every single bonus and challenge possible. That said, 1-bit probably won’t catch on with everyone. 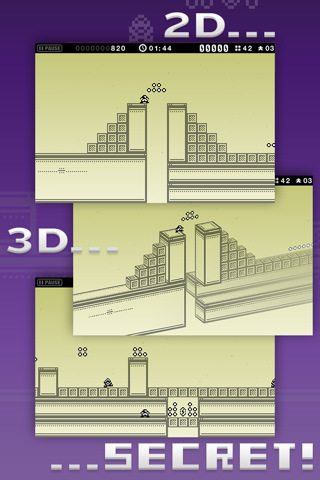 The high difficulty creates the kind of learning curve that will frustrate some users, but for other gamers, the lack of a back button and addition of secret paths leaves plenty of opportunity for playing 1-bit Ninja over and over again. There were some points where I felt the jump button response time lacking just long enough to create numerous frustrating deaths, but excusing this one small issue could generate hours of fun. 1-bit Ninja sinks you into that sweet nostalgic appeal, but all those little surprises, from springs that change your direction to secret paths, are enough to make this a wonderful buy for some, but not all, iPhone gamers. Bottom Line: 1-bit Ninja offers a solid update to a beloved era of games, but the intentionally challenging gameplay and lack of difficulty modes may ultimately turn some away from the $1.99 price tag.